Startling news from Toronto on a name change for one of North America’s most favourite celtic-punk/rock bands. Formed back in 1996 they released six studio albums and one live one, and in the process built up a massive following who called themselves ‘Haggis Heads’. Anyroad here’s what the band themselves have to say on the matter, lifted directly from their web-site. It all happened rather quickly, as is often the case with musical endeavors. In March, 1995, Craig had just secured a gig and although the songs had been written, he didn’t actually have a band or even a band name. Amazingly, within a matter of weeks, Craig had a kilt-rocking band of Canadians ready to take the Toronto pub scene by storm. Looking back to those early days, one could say that the world was a different place than it is today. By the same token, Enter The Haggis is a different band today than it was then, with Craig remaining as the only original member. Most of us were teenagers when we joined Enter The Haggis and today some of us are married and have kids of our own. Many of you have witnessed this transformation before your very eyes. During this time, we’ve tried to push ourselves to continue learning and improving as musicians, songwriters and hopefully, as people. Ultimately, we feel like every bit of growth we’ve achieved has been realized honestly, organically and always with the best interest of the music at heart – but nothing can grow and thrive as we have without an incredible support system and for us, that support system is you: our fans, friends and supporters. After almost twenty years as Enter The Haggis we have decided to change our name. Truth be told, we’ve been wrestling with the idea since 2004, when we released our album, Casualties of Retail. This debate has come up with every new album and we feel that now is the right time to take this next step on our musical journey. We’re very proud of our history as Enter The Haggis, but the legacy of that name no longer fits our identity. While it does convey the Celtic side of what we do, it also paints a one-dimensional picture that doesn’t represent our varied musical influences. Since Craig is the only original member of Enter The Haggis, a new name also gives a common start for something that we’re all creatively invested in. As for our new music, we describe it as ‘Northern Roots Rock’. We feel that that speaks to our Canadian spin on American roots music and our use of traditional instruments with a rock edge. Folk music focuses on the power of meaningful lyrics, which continues to be a focus in our writing. Rest assured that when you come to a show you’ll find the same five guys pouring their hearts and souls out on the stage, playing all of your favourite ETH songs, happy to say hello and share a pint with new and familiar faces. We’re super excited for what the future holds and we hope that you will allow us to continue to bring you the very best of what we have to offer as musicians and as people. Enter The Haggis celebrate their last show as Enter The Haggis on October 11th, 2014, at the Westcott Theater in Syracuse, NY. YOU: This is a great decision and I support you 100%! US: That’s not a question but THANK GOD!!! We thought you were going to hate us. US: The best thing you can do is purchase a ticket for one of our upcoming shows in your area. And if you want to take it one step further, you can contact the venue in your area that we’ll be performing at and let them know that you continue to support us and you will be attending the show. YOU: I’m a card carrying Haggis Head. Can I keep my card? US: Well… we never printed cards but for sure! YOU: What is Jubilee Riots’ official bird? YOU: Can I still buy a Haggis Head t-shirt? US: Yes, but we aren’t printing any more so order them online or come to a show before they’re gone! YOU: What does Jubilee Riots mean? US: The Jubilee Riots are an integral part of Toronto’s Irish cultural history. You can find it on “The Google.” They came at a cost but the positive outcome was greater freedom of expression. Our band formed in Toronto and we’ve been influenced by Celtic music, so our new band name is a nod to both our geographic and musical roots. This new name also reflects our many contrasts: the celebration and sorrow found in many of our songs (One Last Drink for example), our use of traditional and modern instruments, and our story as a Canadian band finding love and affection in the USA. YOU: I have a Haggis Head tattoo and have devoted my entire life to your teachings. I’m now spiraling in a spiritual vortex of confusion. What do you recommend? US: Your unbelievable devotion isn’t something we take lightly. You’ve chosen to carry us with you – both in your hearts and ON YOUR BODIES through all your life’s twists and turns, and it’s humbling. That’s why Brian is collecting the names of everyone with ETH ink – once he’s confident he has a comprehensive list, he’s going to design a tattoo for himself with all of your initials, so we can carry all of you forward with us. YOU: Will you continue to play my favorite ETH songs? YOU: If I’m not a Haggis Head, what am I? US: You guys are amazingly creative so we’ll leave this up to you. Let us know when you figure it out! 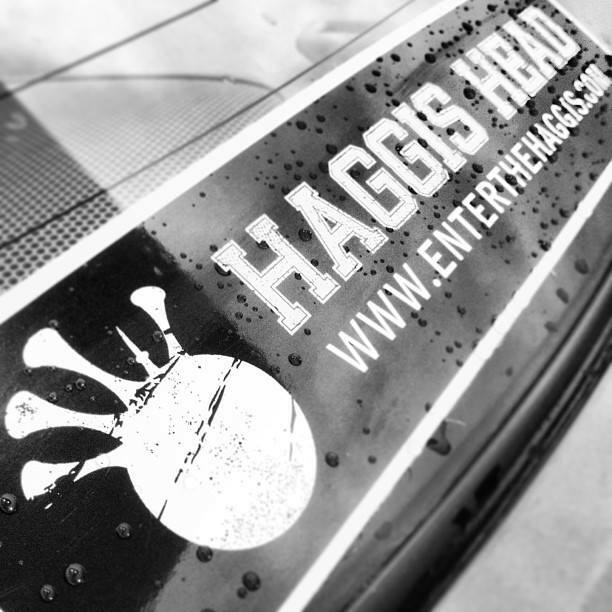 YOU: Will http://www.enterthehaggis.com and social media sites continue running? YOU: What other names did you consider? US: Today’s Modern Camel, The Strolling Drones, Lewd Reeds, Early Machines, A Portrait of Penguins, Schmenter the Shmaggis, Whaggis, Trevor Lewington and The Shipwrecks… it was so hard to choose. YOU: Can I use the name Enter The Haggis for my band now? US: No, this is like an ex-girlfriend situation where we don’t want to be with them but don’t want anyone else to have them either. YOU: When is Jubilee Riots’ “Penny Black” being released? US: November 1st at Port City Music Hall in Portland, ME – and November 4th worldwide! YOU: When is the band’s first show as Jubilee Riots? US: October 15th and 16th at Hugh’s Room in Toronto. We thought it fitting as the first Enter The Haggis show was in Toronto. YOU: Can we expect anything different at a Jubilee Riots show or will it basically be the same as an Enter The Haggis show? US: We’ve got a few things up our sleeves to make the live experience even more exciting, and of course we’ll be featuring music from Penny Black. We’ve also ordered a massive Stone Henge-looking set piece that will be lowered down behind us during our shows – it’ll be at least 18” tall. YOU: In a fight between Batman and Superman who would win? US: According to Trevor’s 3-year-old, Superman would win. More specifically he would use his super strength and throw Batman into the garbage then he would make a fort out of the couch cushions and hide there because there are moose coming. YOU: If I wear my Haggis Head garment to a show can I have something for free? US: Ummm… sure. How about a free copy of the new CD? YOU: Can I have a free domestic beer or well drink too? So their you have it! Hopefully the name change will lead to bigger and better things for the band but I’m sure there’ll always keep their celtic roots close to their hearts. Do the band a favour and follow them on their new media and share this news if possible. for more on the anti-catholic Jubilee Riots go to the facebook page Pilgrims: The Jubilee Riots And The Irish Experience In Victoria Toronto which has all you need to know. Pilgrims is a short film that seeks to tell the story of Toronto’s Irish population in the mid-1800’s through the largely forgotten Jubilee Riots of 1875. Beginning in 1847 thousands of Irish immigrants poured into the newly industrialized city of Toronto. Though they came to Canada seeking a better life they faced extreme poverty and fierce discrimination but they began Toronto’s transformation from a British city to a multicultural one. or you can try Wikipedia!